Read about the artists we represent, and learn about the places and causes we care about. Nature pulled at Dave Wachs from the time he was a kid. At one point, for several years, Dave tried to spend more time in a day outdoors than inside. He says only a leash could have kept him on trail when he hiked with his parents. Dave still has an impulse to hike, dirt bike, or ski up and see what’s on the other side of the ridge, and he’s spent the last forty-odd years describing his findings with paint. “I feel lucky to know that my inspiration comes from Nature,” Dave says. “I made the conscious decision, too.” He studied fine art and graphic design at Montana State in the late 70s, after growing up in Tucson and then Portland, and recognized his natural subject matter while in college. Nature has been Dave’s “canvas” ever since. 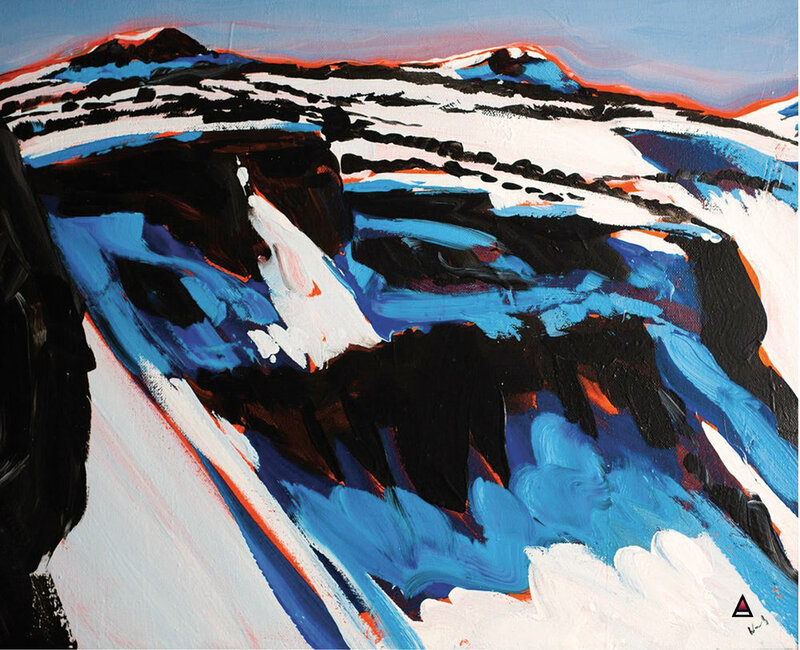 And rather than paint from someone else’s photo, he takes AT skis all around the upper reaches of mountains like Jefferson and the Sisters, mostly in spring. He’ll take a photo if he can, but he’ll always draw it, as loose as his paintings and “more cryptic.” “Typically, it’s about the composition. It’s almost like a graphic that catches my eye.” Dave did design for Nike in the 80s, but he attributes more influence to “impactful” works from people like visual artist Gerhard Richter and writer Ivan Doig. For his part, Wachs translates that energy into surface quality, texture, added dimension, which makes sense when you’re portraying the Cascades. Dave Wachs is sixty years old. He helped spawn a pro skier, his son Lucas Wachs, and he’s owned an avalanche beacon since 1975. Dave has watched the Northwest climate for over four decades as a skier. “It’s happening,” he says, “it’s definitely changing. I’ve seen it.” Extremes in seasons and weather events, the new unpredictability, have all caught Dave’s attention. “It’s never gonna be like it was,” he says. It will be interesting to see if more and more rocks creep into Dave’s work.